To read an in-depth review, with more photos, click on over to webBikeWorld. 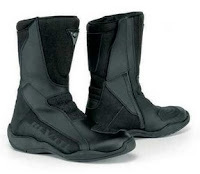 I provided comments regarding my experience with the Fusion boots to wBW in May 2006, and again a couple of days ago as a long-term follow-up. They're published at the end of wBW's review (the jig is up: I'm "D").